Do you have Poly-B domestic water piping in your home? Have you experienced a leak or flood from existing Poly-B piping? Has your home insurance provider suggested re-piping your home? Are you interested in re-piping your home but don’t know where to start? If you answered yes to one or more of the above questions, then Blue Moon Plumbing & Heating can help! If the water main from street to property is also Poly-B, we can provide a separate option on the quote to replace this too! Call Blue Moon Plumbing & Heating today to arrange your FREE home visit! We are looking to add to our team. Please take a look in our careers section for more details. We are looking to hire a hard working, career minded individual(s) who have a fantastic customer service skill set, someone that is a great troubleshooter and is confidant in plumbing repairs in residential & commercial projects. We would like someone that has had a 2 – 5 years service experience and is capable of working as a team and on their own. We offer excellent wages along with extended medical, company vehicle, phones and uniforms. We are looking for someone that wants to make their mark in this company, all while joining this tight knit team. If this peeks your interest…… We want to hear from you. 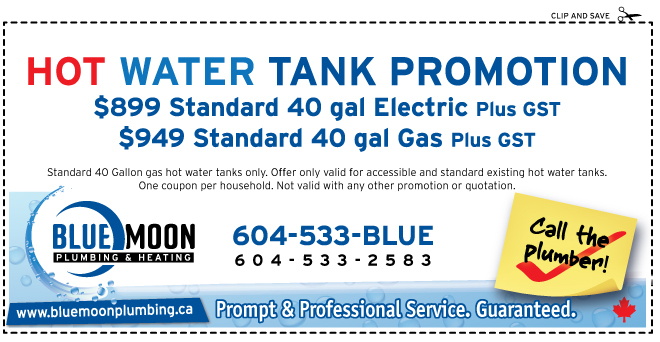 Hot Water Tanks – Passing The Savings On To You! Just in! We’ve secured some great pricing on new hot water tanks and are passing the savings on to our valued customers! Check out our Promotions Page or view the coupon below! Chris Trozzo is our President and co- owner of the company. Chris has expertise in all areas of plumbing, heating and gas fitting, as well as specialized areas including in-floor radiant heating systems, water main repairs, back flow testing and drain tile repair and/or replacement. Lisa Trozzo is our Controller and co-owner of the company. Lisa is our skilled manager of operations and finance, and is a chartered accountant. Rod, Derek, Jason, Chris E. and Tyler are our lead service technicians. They are fully licensed Journeymen Plumbers, each with a B gas fitter ticket – and they will do a great job for you! Please feel free to schedule a service call or a free estimate for projects you may have, big or small. We will give you a competitive rate and we guarantee our work.